It’s been a year since I last wrote here. Most of my foodie blog posts can now be viewed on Vancouver Bits & Bites (www.maryinvancity.com) however I recently received Tea Sparrow‘s monthly subscription box for April just in time for Mother’s Day! 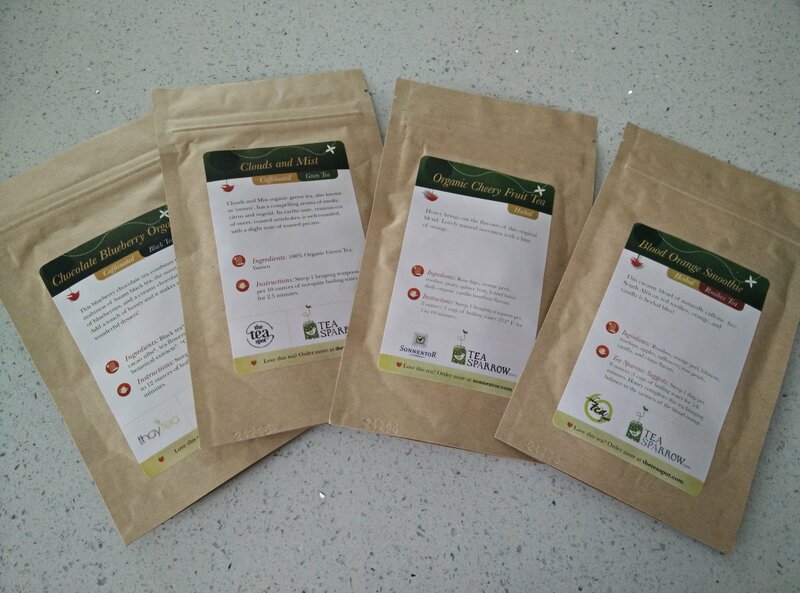 Last year I wrote about Tea Sparrow and it’s launch of the monthly tea subscription box. I’m happy to see that they are going strong and sending out monthly teas that different guests will enjoy next time you host a tea party. Or if you are a loose leaf tea lover, this is a great way to try different varieties. This month’s tea subscription came with 2 Caffeinated and 2 Herbal Teas: Chocolate Blueberry Organic (Black Tea), Clouds and Mist (Green Tea), Organic Cheery Fruit Tea (Herbal), and Blood Orange Smoothie (Rooibos Herbal Tea). I hosted a small tea party with some homemade angel food cake and banana cake, and went to work making the different teas to try. First one up was the Chocolate Blueberry Organic black tea from Thay Tea, a social selling, direct to home, tea company. I loved the smell of the sweetness of the chocolate and blueberries when I first opened the package. When I first made the brew although it says to steep for 3-4 minutes, in reality it probably needed to be steeped for about 5-10 min in hot water. As it’s a black tea, having it a bit darker gives it a richer flavor. Ingredients in it include Black tea, cornflowers, cacao nibs, tea flowers, and natural botanical extracts but when I drank this team, blueberry was the primary taste. The Blood Orange Smoothie herbal rooibos tea was next, from The Tea Spot. I really enjoyed this and next time I steep it, I’ll make it with some milk/cream so it gives it more of a creamy texture. My friends all really enjoyed this one out of the 4 packages the most. This tea has a very citrus flavour as the ingredients included Rooibos, orange peel, hibiscus, rosehips, apples, safflowers, rose petals, vanilla, and citrus flavors. Since it’s herbal, you can drink lots of this and still not worry about not sleeping at night! We next tried the other herbal tea, Organic Cheery Fruit Tea from Sonnentor. This tea’s name was a little misleading. I assumed it would have a more fruity taste to it, but the fennel in this tea was overpowering. If you enjoy more of a licorice taste with a hint of orange, then you’ll enjoy this tee. I’m not a fan of licorice, so this tea was a no for me – however I introduced it to a friend who really enjoyed fennel tea, so this was great for her evening tea before bedtime. Ingredients included Rose hips, orange peels, rooibos, pears, quince fruit, fennel bitter dark, organic vanilla bourbon ﬂavour. The final tea was the Clouds & Mist green tea from The Tea Spot, which reminded me of a light Chinese green tea – not like matcha green tea. Ingredients included 100% organic green tea, yunwu. As the description states, it has an aroma of smoky, citrus and vegetal, very earthy and slight note of toasted pecans. Looking for a nice green tea to round out all the other teas, this was a great way to end the sampling. This tea box winner? Blood Orange Smoothie! So for Mother’s Day this year, if your mother likes tea, why not treat her to a monthly subscription of teas where she can sample teas from around the world and host her own tea parties? Check out Tea Sparrow – www.teasparrow.com – Subscriptions start from $20 a month and a one-time gift is $25 for a month.